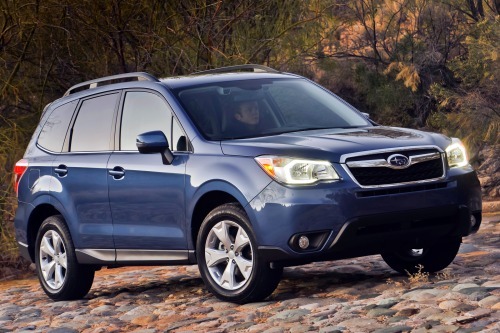 Subaru is recalling certain all-new Subaru Forester vehicles over a carpet issue that could cause a crash. Affected by Friday’s recall are 10,137 model year 2014 Subaru Forester crossovers that were built between January 2013 and March 2013. The vehicles in question may be equipped with improperly manufactured floor mats, which may curl when exposed to heat. A curling driver’s side floor mat may interfere with the operation of the vehicle’s clutch, brake and accelerator pedals. This interference could result in high vehicle speeds and difficulty stopping, which may cause a crash, according to the National Highway Traffic Safety Administration. Subaru will begin notifying customers of the recall by the end of April 2013. Authorized Subaru dealers will replace each of the vehicle’s four carpeted floor mats with new ones at no cost to the owner. In the meantime, owners may contact Subaru at 1-800-782-2783. Subaru’s recall campaign number is WQH-44. Concerned Forester drivers may also contact the National Highway Traffic Safety Administration’s Vehicle Safety Hotline at 1-888-327-4236 or visit www.safercar.gov. The NHTSA campaign number is 13V159000. According to documents filed with the NHTSA, Subaru discovered the floor mat defect on April 1, 2013. Initial signs point to a supplier error, but Subaru has yet to conclude its investigation. Subaru decided to issue the recall prior to closing its investigation because federal law requires all auto manufacturers to notify the NHTSA within five business days of determining a safety defect. In January, certain model year 2009-2012 Subaru Foresters were involved in a substantial electrical recall. The recall, which covered almost 634,000 vehicles also included 2010-2011 Subaru Legacy, 2010-2011 Subaru Outback and 2006-2012 Subaru Tribeca models. Affected vehicles may contain defective puddle light accessories, which are intended to light the areas under the doors. The faulty lights may short circuit when in the presence of road moisture, which could generate heat and result in a fire. Subaru also recalled over 50,000 vehicles in North America earlier this year due to a remote starter problem that may cause cars to start on their own. The recall affects select model year 2010-2013 Subaru Legacy, Subaru Impreza, Subaru Outback and Subaru XV Crosstek vehicles equipped with an Audiovox remote engine starter (RES) accessory. NHTSA documents indicate that the RES fob may malfunction when dropped and accidentally transmit an engine start request without pushing the button. As a result, the engine may start and run for up to fifteen minutes. The vehicle’s engine could run until the fob’s battery is exhausted, or until the vehicle runs out of gas. The defect may also lead to carbon monoxide build-up if the vehicle is parked in a garage or other enclosed location.